Following recent bold renditions of Vans‘ most iconic silhouettes such as the COMME des GARÇONS CDG Authentic and thermochrome Old Skool, the Californian skate staple has returned with a camouflage-adorned UA Anaheim Factory Era 95 DX. 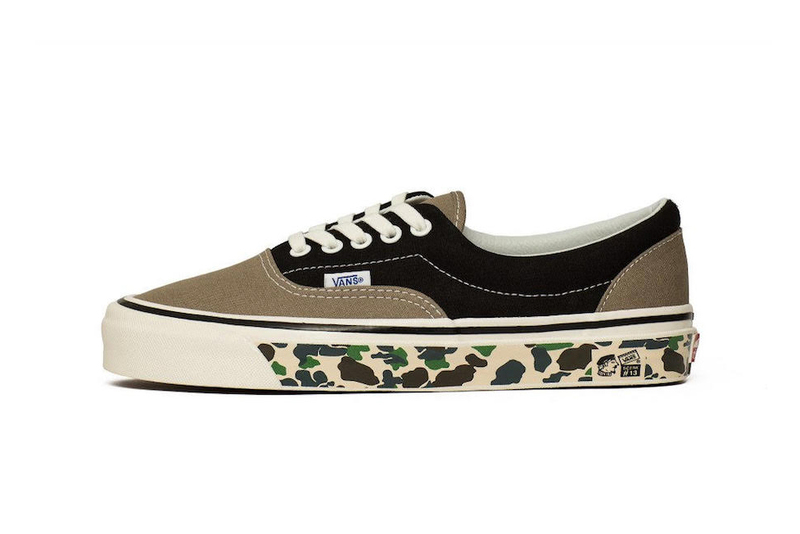 Sporting a clean mix of brown and black on its canvas upper, Vans has given the Era 95 DX a split sole unit graphic which sees both camo print and the original checkerboard design divided between two sides. Featuring the classic “OFF THE WALL” red license plate heel tab and a “Series 13” lateral-side sole graphic, the pair is finished with complementing cream laces, a bold black wall stripe and a contrast white and blue tag. Being an Anaheim Factory edition, the “Camo Tape” Era 95 DX pays tribute to Vans’ first factory with original style numbers and a re-issued color palette, higher glossed foxing tape and an authentic drill lining. Priced at $85 USD, the Vans UA Anaheim Factory Era 95 DX “Camo Tape” is available from Vans.com, and other stockists like Chmielna20. In case you missed it, here is your best look yet at the RHUDE x Vans bandana-inspired collection.